One of the best hardy geraniums is ‘Rozanne’. It has large purple flowers that bloom from early summer until autumn. In a good year, it performs for six months. It is a tremendous sprawler, and isn’t recommended for small gardens. Even though we don’t really have the room, we grow it in several of our borders. We control its conquistadorial tendencies by hacking chunks off the clumps — which is really a form of extreme dead-heading. It looks frightened for a few days, and then it quickly pulls itself together and produces a fresh flush of flowers. Both are hybrids of G. wallichianum ‘Buxton’s Variety’, with G. himalayense providing the other parent for the first, and G. shikokianum var. yoshiianum for the second. And both are patented plant varieties, which means that they have brought in wads of revenue for the patent holders — Blooms of Bressingham and Dutch breeder Marco Van Noort, respectively. However, in 2010, a court ruled that they were too similar to be distinguishable, and that ‘Jolly Bee’ should cease to exist as a separate variety — bad news for Van Noort, who would no longer receive plant breeder’s royalties. To confuse matters further — and such are the convolutions of plant nomenclature — the original name of ‘Rozanne’ is ‘Gerwat’ (the first appellation under which it was registered) although it is known as Rozanne® in the trade. 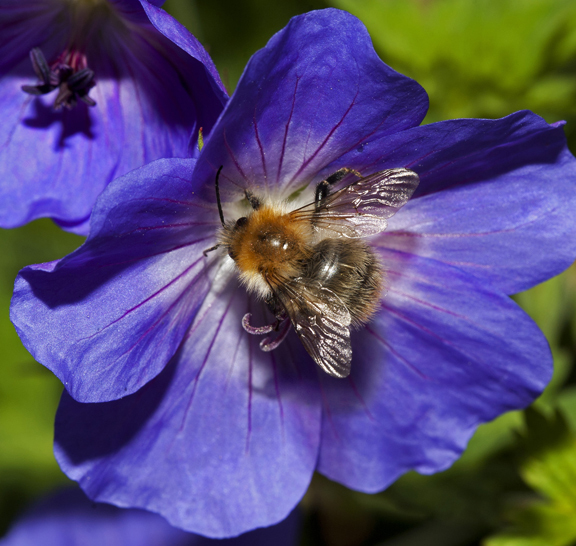 The thing that is rarely written about ‘Rozanne’ though (or ‘Jolly Bee’, for that matter), is that it is a complete hit with invertebrates. 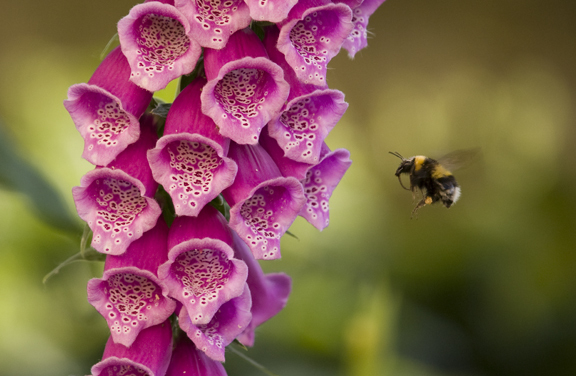 Honeybees, bumblebees, flies, hoverflies, ants and other small creatures flock to it, to drink its nectar and to pluck the bits of pollen that are tucked into its stamens. 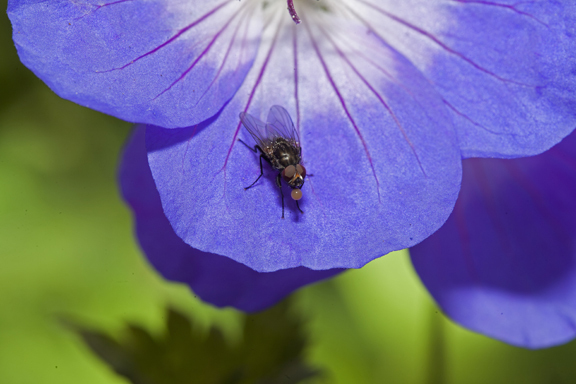 The marmalade fly (above) is one of the few hoverflies that actually eats pollen. Before ingesting the grains, it crushes them between its front legs (I nearly said “paws”, as I have a huge affection for this particular species and find it easy to get a little woolly about it). ‘Rozanne’ is sterile, that is, it produces no seed. This characteristic allows it to bloom for a very long period. Normally, a plant’s biological clock tells it to stop flowering when it has made enough seed to perpetuate itself, but a sterile plant has no “stop” for the blooming mechanism. It flowers until colder weather and lower light levels say it’s time — finally — to quit. So, the gooey amber pollen grains that you see stuck to the furry stigma below have fallen on barren ground, as it were. Yes, the fly is blowing a bubble. Slowly, slowly out and slowly, slowly in. I’m not sure why it does this, but I have read that it may aid food digestion. In any case, it was so focussed on bubble-blowing that it stayed perfectly still while it was having its portrait taken. Isn’t it lovely? 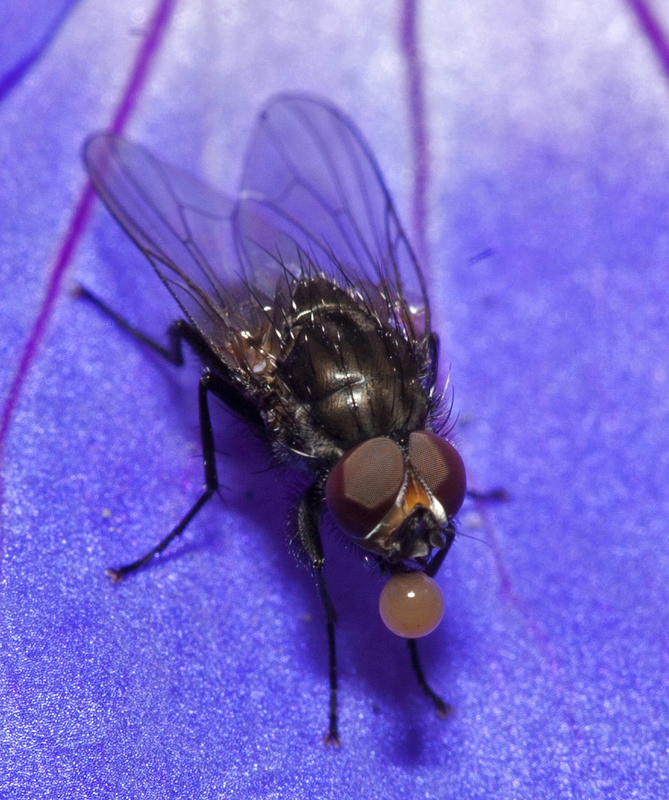 A fly blowing bubbles while having its picture taken – I’d suggest it was a teenager, except that they generally hide from the camera with a skill that must be courtesy of all those raging hormones. Great photos. What an amazing shot of the fly! Who knew they blew bubbles. 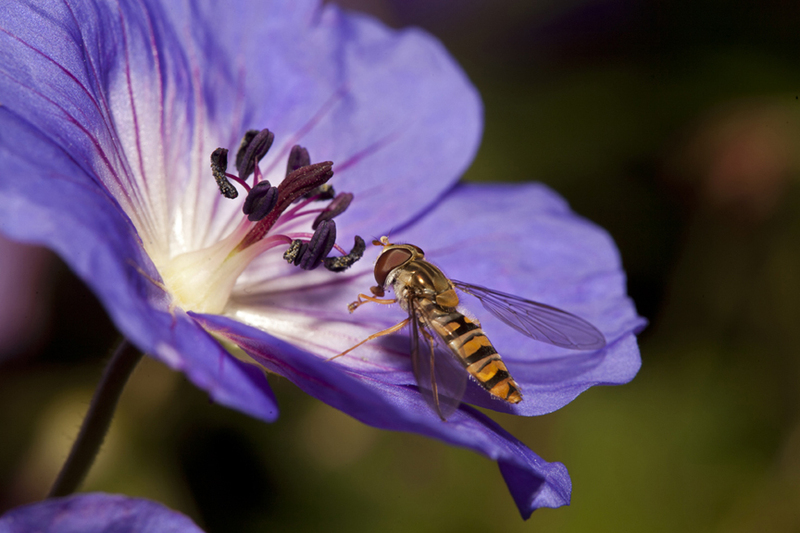 Sadly after an amazing start to the season in April – we have had very few bees in the garden until this month, although hoverflies a-plenty. Rozanne is indeed a delightful thug. Blow – I used amazing twice, must expand my vocabulary! Ewwwwwwwww! I do not like that bubble-blowing fly! Fantastic bumblebee knowledge Jane. Please come to my garden next summer and ID my geraniums. Their flowers are all different shades of purple but some have furry leaves and some don’t. One is still flowering – I presume this is ‘Rozanne’. Thanks, Elizabeth, Janet and Karen — the bubble blowing was a revelation for me too. I’ve been looking at the little pictures in the garden for the last several years, and I am seeing all kinds of exciting things. Kathryn – I agree, ‘Rozanne’ is a great “doer”. Our soil is really dry, but it thrives. It doesn’t much like shade though, as I discovered. But there are are loads of other good shade-tolerant geraniums, as you know. Kate — how can you NOT like the bubble blowing? Because it’s gross, that’s why! The photographs are exceptionally good; you are obviously playing with a great macro lens and using it expertly. Re G. ‘Rozanne’, I find it the most useful plant to place among large drifts of spring bulbs. It takes up very little space at the root, doesn’t seem to spread at the root either and then covers up all that bare earth left when the bulb foliage has died down. It is particularly good among bulbs which one considers precious as you don’t have to plant on top of the bulbs at all and so there is no risk of damaging them. Jane , thanks for sharing the information with us . I must try to get Rozanne somewhere as apart from attracting insects it is a lovely colour ! This is now my very favourite fly picture. What camera did you use? Beautiful detail and stunning colour. 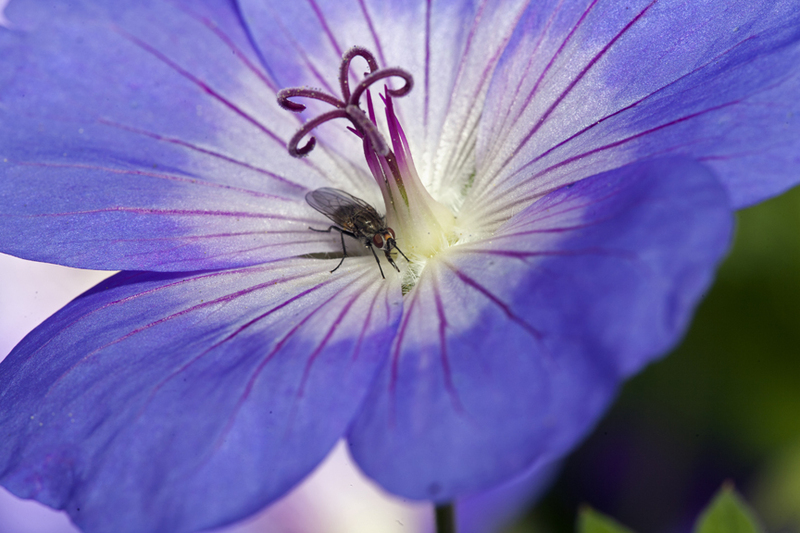 I’ve loved Rozanne geraniums since they came out and have wonderful what happened to Jolly Bee – it’s slightly bluer cousin. Great info and pictures. 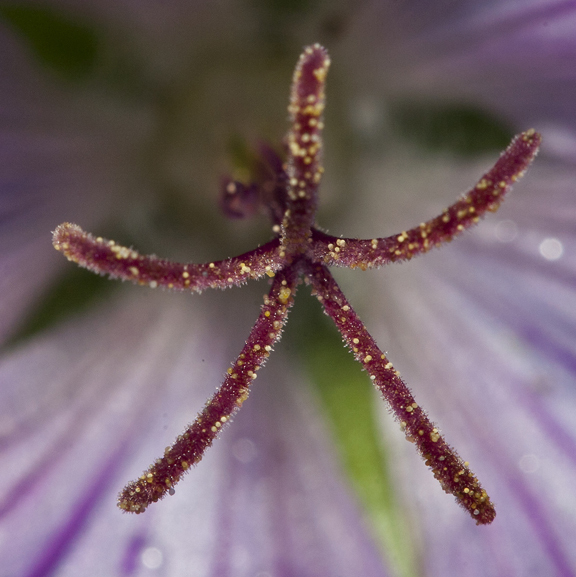 Do you know what ever happened to Tiny Monster geranium – they seem hard to find now also. Hi Barbara, I see you are in the USA, so I’m not sure about ‘Tiny Monster’ over there. It’s available in Ireland and the UK in some places, but maybe it didn’t suit American conditions? I’ve never grown it, but have admired it. Thanks for all the very nice comments! Paddy — Yes, ‘Rozanne’ is a great post-bulb performer. I use it over my snowdrop bed, among other places. Sheila — It’s quite an old camera at this point (4 or 5 years old? ): a Canon 5D, with a 100mm/F2.8 macro. My husband has newer and higher-resolutioned cameras, which I think I might switch to for this kind of thing. I crave MORE detail! It’s important always to shoot RAWs, of course. Bees blow ‘bubbles’ of nectar to evaporate water off to, eventually, make it thick enough to be honey (if moisture content too high it will ferment). Maybe the fly was concentrating the ‘fluid’ – the nature of which I fear to consider – as, as you say, an aid to digestion, weird. Alternatively he enjoyed it so much the first time he just had to try it again! You may yet help me appreciate flies. Well-done! Well, I only really started appreciating them when I started taking photos and blowing them up. Some of them are quite beautiful! Jane, great to see such wonderful photos of the little visitors to our gardens. Must show this to my four year old…he loves spotting bugs in the garden. Jane, eventually, my two brain cells have met and the name of another similarly good geranium has returned to me. G. ‘Ann Thompson’ is of similar habit with large magenta flowers and is an excellent plant in the garden and, again, particularly good planted to cover spring bulbs. And ‘Patricia’ is another one! And possibly ‘Brookside’ — I’ve never grown it, so don’t know how it behaves. (I would love to hear from Brookside-growers!) But I think that ‘Rozanne’ may have the edge on attracting critters, perhaps because of its colour? And maybe the white centres are tempting too? You are currently reading Life on Rozanne at One Bean Row.